One of my favorite restaurants does an awesome “eggs in purgatory” for brunch, which is normally just eggs poached in spicy tomato sauce with some toast. 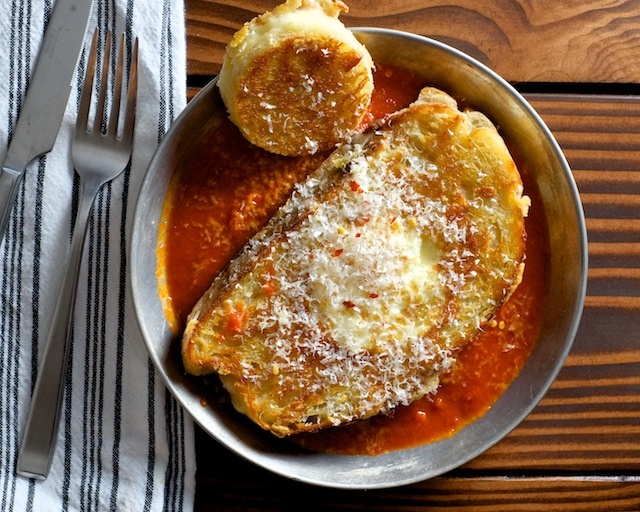 Rather than trying to poach eggs to order in pans of tomato sauce, they speed up the cooking by serving it with the egg grilled into a slab of buttered bread and a puddle of very, very spicy tomato sauce on top. It is an improvement on the original, I think. The fact that everyone is into putting eggs on top of and inside of everything lately made it easy for me to stumble on “grilled cheese egg in a hole” somewhere on the interweb and, naturally, I was inspired to “purgatory” it. 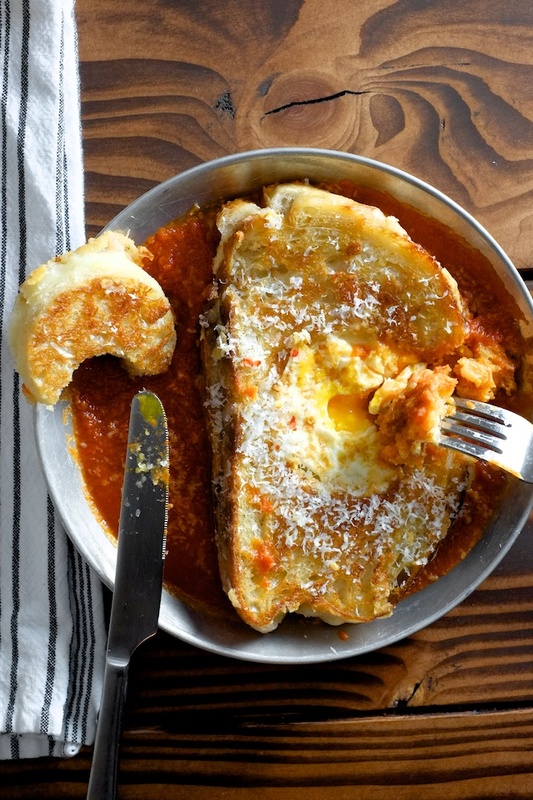 Crispy grilled cheese with a runny egg inside and spicy tomato sauce underneath sort of defies categorization. You can eat it for breakfast, brunch, lunch, dinner, or midnight snack, and nobody will judge you. Not for the timing anyway. I tried not to eat this entire thing for lunch after I finished taking photos of it, but I did not succeed. At not eating it. All. 1. Heat your sauce in a saucepan over medium low heat. I like to use a very simple recipe for this, with not much more than tomatoes, butter or olive oil, and some onion. You can use a store bought tomato pasta sauce if you want, but choose something simple, without any weird meat added and minimal herbs (I think a little basil is fine). Add crushed red pepper and garlic to the saucepan, taste it and add salt if needed (it should be spicy! and well seasoned), and lower the heat to keep the sauce warm while you make the sandwiches. 2. Preheat a nonstick pan over medium-low heat. 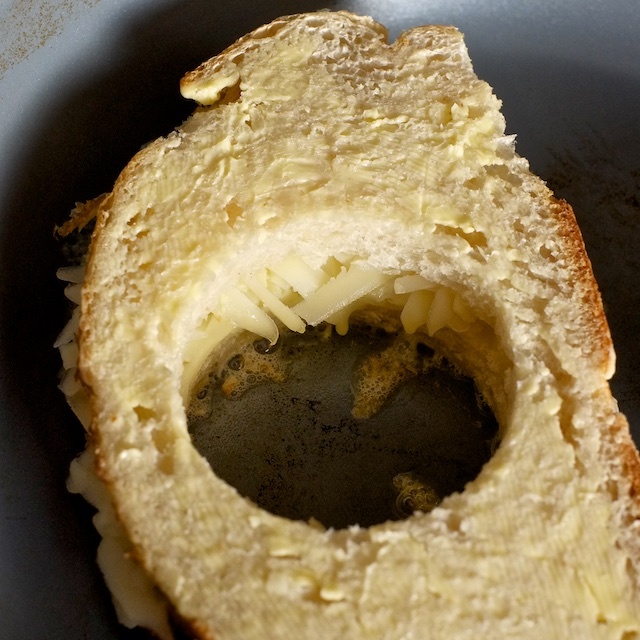 Grate your cheddar and butter the outsides of the slices of bread. After buttering, lay the buttered sides of the bread down and pile as much cheddar as you can fit with a sprinkle of parmesan on one side of each sandwich. Lay the second slice on top, butter side out. 3. With a round biscuit cutter or knife, punch holes in the center of each sandwich, keeping the punched circles in tact. 4. Carefully place your sandwiches in the pan (and the circles too! ), buttered sides out. Cook the sandwiches on one side until the bread is nicely golden brown. Carefully flip the sandwiches to cook on the other side. 5. While the second side of the sandwich is browning, crack an egg into the center of each sandwich and top it with a little sprinkle of salt. 6. When the egg is well set on one side and the sandwich is nicely browned, very (very) carefully flip the sandwich over to finish cooking the egg on the other side. It helps to shake the pan a bit to make sure the egg isn’t stuck before you flip. 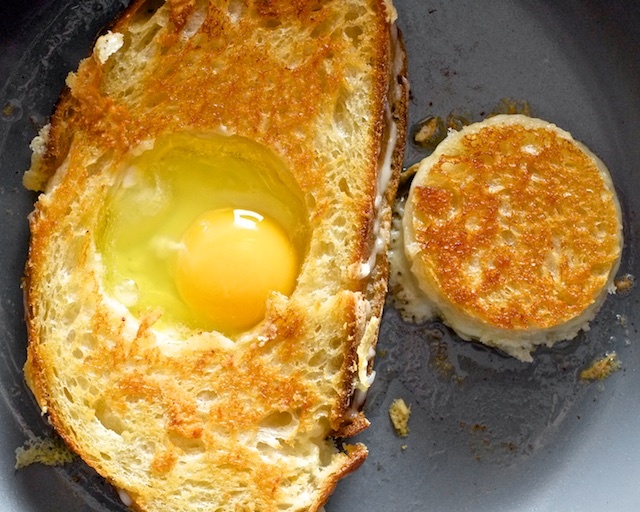 Use a wide spatula for the flip and be as quick as you can to avoid breaking the yolk. 7. While the egg is finishing cooking, prepare two plates with a scoop of tomato sauce. Once the egg is set on both sides but runny in the middle, transfer it from the pan to your pre-sauced plate. 8. Garnish with more parmesan and an extra sprinkle of crushed red pepper. Eat with abandon.